"I just want to be able to compete this week, play all four days and give myself a chance on the back nine on Sunday to win this thing." 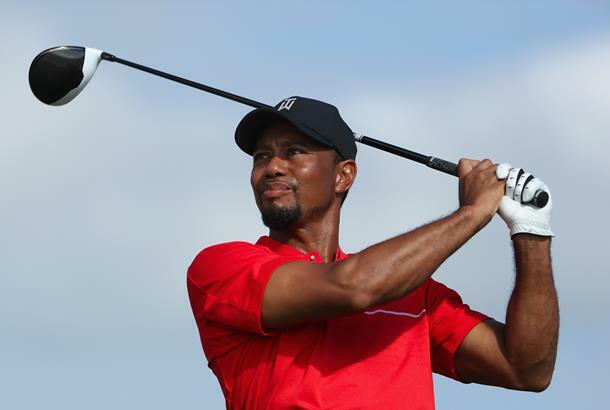 Speaking to the media in a press conference on Tuesday, Tiger Woods said he just wanted to get through four rounds this week - before adding that he wants to be able to compete and give himself a chance to win on Sunday. Yet optimism about winning wasn't the overarching tone of that came from Woods, who mostly talked about 'loving life' being pain-free but that he is still very much 'working out what his body can and can't do' as he attempts to get through the next four days. ➤ Patrick Reed: "I Wouldn't be surprised if Tiger came back and started winning a lot"
It's the second time in as many years that Woods has made his comeback from injury at the Hero World Challenge, but he was honest in his admission that he feels a lot better than he did when he tried to come back last year. We've picked out the key quotes from his press conference, or you can scroll down below to watch the full thing. "It's different from the last two prior when I've come back at this event, at the Hero World Challenge. At Isleworth, as I said, I was still struggling with some nerve issues down my leg...,last year I was still struggling a little bit and this year it's night and day. "Last year I was able to hit some good shots, able to play, but in looking back on it now, I look on it as playing in slow mo but it was as hard as I could hit it. I didn't realize how bad my back had become and how much I was flinching and just how slow I was. I didn't realize it because it's been a slow degrading process. "I thought I had some speed, thought I was playing halfway decent, shot some good scores, but now I've looked back on it and man, I didn't even have much at all. Now to come out here and be able to do what I've been doing the last few weeks with the guys, it's been a lot of fun. I played some great rounds with the guys at home. It was fun to be able to do that again, which I hadn't done in years." "You know, I hate to be so mundane on this one, but honestly, I'm just looking forward to getting through these four rounds and having an understanding, a better understanding of where I'm at. I don't know where I'm at. What I mean by that is I don't know how hard I can hit it, what shots can I play." "It's supposed to blow this weekend and if it blows 30 miles an hour, I'm going to have to hit some shots. I'm going to have to lean on a few and take something off of it, hit some shots, some creative ones. I may have to blast a few. I don't know yet. I don't know what the future entails in that regard because I'm still learning this body and once I get a better understanding I can give you a better answer." "I'm winging this by here because I don't know what my body can and can't do yet. I just got the go-ahead a little over a month ago, but I still don't know. I was saying to you guys, I don't have any pain anymore in my back. I have some stiffness, like no duh, it's fused. "So I'm learning that, what my body can't do yet and what it can do. Just going to take a little bit of time. The people who have had my procedure of L5-S1, the average age is 58. Me being 41, 17 years younger, most of the people who have had it, like for instance Lanny and Lee, they were well past their playing days when they had the procedures done. I'm still right in my playing years and so it's hard for me to ask people what were you experiencing because they weren't going at velocity at that age." "The neatest thing for me is to be able to get up out of bed and I can grab a club and not use it as a crutch. So now I'm able to take a swing. That's so exciting, you have no idea how exciting that is, and I'm just so thankful that I've had this procedure and I've gotten to this point. "It's not pain as I said, I'm just stiff. So even at the Presidents Cup, you guys asked me about that, what does your future entail. I don't know because I wasn't allowed to hit golf balls yet. Even when I start hitting shots, I remember my 9-iron. Okay, first 9-iron went maybe 80 yards. I was just afraid to hit it. "And then as I got through the practice session, I started getting more comfortable, the next day I was full out and they gave me the long irons and they gave me the woods. Then I asked him, Can I hit a flighted 2-iron again, drop down hit the stinger? He said, Absolutely, you're fused, go. Trust me I didn't really put the full speed into it until I felt comfortable with it. And it took time. "As I said, I've only been doing this for a month, so give me a little bit more time, a little better understanding, and especially let me play this event and see what I can and can't do. I'll have a better understanding once I'm in game speed. I know I've always hit it harder come game time because of adrenaline and I'm looking forward to it and I'm also looking forward to see how I feel. "I don't have the nerve pain going down my leg, I don't have my leg twitching all over the place, I don't have these issues anymore. So yeah, I'm loving life now"
"Well, I think the early apprehensions were I started to crank it up, when I got the full-go is the full-go, how's that going to look? Is full-go going to be some guy who hits it 240, 250 in the air as full-go? That was hard to -- it took me a few days if not a week to really come to grips with I don't know what my full-go's going to be. "And then when I finally started to get it to where, hey, I've got a little pop on this thing, okay, I can hit it a little bit harder. Then I started playing practice rounds with Rickie, that was fun to be able to go out there and say I can keep up with him, even sneak a few by him, and the same thing with some other guys. That gave me a lot of confidence to be able to do something like that. "I was talking to my surgeon about this is that I felt how long will this fused back hold up? It's like my microdiscectomies, how long is that going to hold up. He says, You'll be fine for the rest of your life because it's bone and bone, you're fine. "How hard is it to break a leg? It's not easy break a leg. Same thing, it's not easy to break that part of your back. I'm still trying to sink in that I can start doing things like that, start being more athletic but there's still some apprehension going forward and there's no doubt this week is a big step for me to be able to play golf and be explosive and hit shots"
John Daly: "I'm a short hitter now!"